Monster Munch is an all-in-one third-party Kodi addon. With active developer support and regular updates, it ranks among the most exciting up-and-coming Kodi addons. The Monster Munch addon finds and provides access to free movies, TV shows, music, and more! Online movie streaming is available in both SD and HD with this addon. Monster Munch gives a wide range of excellent options to watch all of your favorite streaming movies online. The Steptoes Repository hosts this addon, so let’s get installing! Check farther down the page if you need a more detailed and illustrated guide to installing Monster Munch. Open Kodi and click on System > File manager > Add source > <None>. Type in http://steptoesplace.net/repo and name it steptoes. Click OK.
Back on the Kodi Home Screen, click Add-ons > Add-ons browser > Install from Zip File. Finally, click Install from Repository > Steptoes Repository > Video add-ons > Monster Munch and click the Install button. Connect to the internet through your IPVanish VPN app and privately enjoy any free movie or TV show you’d like to watch. Beginning with the launch of Kodi 17 Krypton, a setting adjustment is now required to allow third-party addon installation. Check out our Enable Unknown Sources guide to make Kodi accept unofficial addons. Without this new system setting switched over, Kodi will not allow the Steptoes repo source and installation will fail. It is essential that you take the time to make this adjustment. Once you do, you’ll have access to as many of the best Kodi repos and great working addons that the Kodi community can offer! Continue below for a step-by-step guide on how to install this great all-in-one Kodi TV addon, Monster Munch. This guide is divided into multiple parts. 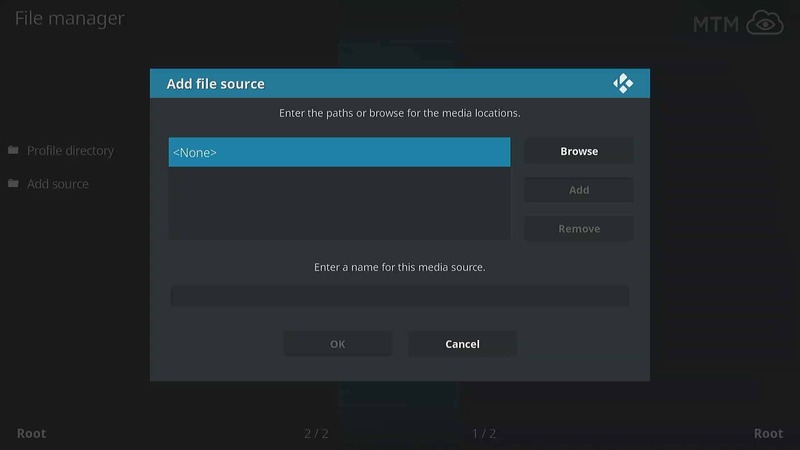 Follow each step to easily provide the addon repository, install the repository, and download this addon to your Kodi device! Any images included in this guide will use the Estuary skin, which is default since the release of Kodi 17 Krypton. You may find it simplest to re-enable the default skin while you follow this illustrated guide. Before you can jump into troves of high-quality content offered by the Monster Munch addon, you must install the Steptoes Repository. This repository is the home of Monster Munch and the first step is to provide Kodi with the repo source location. Follow the steps below to complete this part of the installation process. On the Kodi home screen, select the System icon. It’s the one that looks like a gear cog at the top of the main menu. Next, select File manager near the bottom of the screen. Select Add source on the left side of the screen. Enter the following URL exactly: http://steptoesplace.net/repo, then click OK. Type the name Steptoes into the text box just below this source address, then select OK once more. Double check for typos and small errors, then click OK one last time to complete installation of the source location. Now that Kodi can actually find the repo's source location, you must install the Steptoes Repository before you can use the Monster Munch Kodi TV addon. Follow the steps below to complete this process. Backtrack to the Kodi Home Screen and select the Add-ons menu item. Select the Add-ons browser icon at the top of the menu. Sometimes called the Package manager, it looks like an open box. Select the Steptoes source we installed earlier. Select the repository.steptoes-X.X.zip file (named repository.steptoes-2.1.zip at the time of this article). A pop up message will appear in the top right corner of the screen telling you the Steptoes Repository was successfully installed. At last, it is time to install the addon you’ve been waiting for! Follow the steps below to install the Monster Munch Kodi TV addon and start streaming all the content you can handle! Remaining in the Add-ons browser menu, select Install from repository. Click on Video add-ons in the Steptoes Repository directory. Select Monster Munch for installation. Monster Munch Add-on installed message should appear shortly in the upper right corner. Congratulations! You can now connect with IPVanish VPN then safely and freely access all the online TV streaming, online movie streaming, and online music streaming you could ever want! Grab yourself a free copy of the IPVanish VPN app to protect yourself from prying eyes when streaming free video content with Monster Munch or any other Kodi addon. Take advantage of the IPVanish VPN 7-day money back guarantee to see what a difference it makes when you have no dropped streams or buffering from ISP bandwidth restrictions. Monster Munch Kodi addon has tons of great options for you and a really easy to use interface. What may be my favorite feature is that Monster Munch doesn’t present huge lists of streaming video links for you to sort through when you pick a title to watch. It simply chooses the best available working stream and plays videos for you after you click on a title you want. You read that right; it automatically picks the best stream for you and just plays it. Located in the Step Toes Repo, Monster Munch has a wonderful assortment of categories. For movies alone, you’ll find 3D, 4K, 720p, and 1080p movies along with categories for the latest movies and even terrible movies! For streaming movies and TV shows, Monster Munch is rising among the ranks and making a name for itself as one of the best working Kodi addons of all time. This is especially true for movie fans, who have praised the wide selection and number of genre categories. But that’s not all Monster Munch has to offer. Monster Munch is truly an all-in-one Kodi TV addon that works great on a Firestick for a really convenient and portable entertainment center. This beautiful addon finds and streams TV, movies, radio, music, and more! Check below for a more thorough look at Monster Munch’s features. Monster Munch is an all-in-one Kodi TV addon which provides access to content of many varieties. The Monster Munch addon was originally focused on online movie streaming. It quickly became the preferred Kodi addon for many movie fans across the globe. It has been praised for its vast assortment of genre categories to stream from. This allows you to easily navigate the addon to find exactly what you want to watch. Monster Munch provides much more than just movie streaming now and is steadily expanding. This addon is also an excellent place for streaming TV shows, online sports streaming, music, and even radio. Movies: Access a wide range of genre selections and stream your favorite films! TV Shows: Catch up on all your favorite shows or discover a new favorite! Radio Stations: Tune into a variety of radio broadcasts! Cartoons: Animation fan? Look no further! Tube Sports: Follow all the sports action! Monster Munch will seek out the ideal link for your preferred streaming. Options include both SD and HD content, as well as 4K streaming. It may take a brief moment to play after you make a selection, so just wait a second between clicks. Thank you for reading this article about how to install the Monster Munch Kodi TV addon! I would greatly appreciate any comments, questions, or concerns you may have about this or any other article on the MTM site. I’ll respond as quickly as possible, though it may take a day or more depending on circumstance, attitude, weather, caffeine, and what-have-you. Feel free to follow My True Media on Twitter , Facebook , and Youtube if you want to stay updated on the best third-party Kodi addons and high quality repos working today. I remember the crunchies of monster munch from when I was a kid. Good stuff this! I’m kinda appalled and amazed at the same time how many free movies are on this Kodi addon. Monster Munch may be the best Kodi addon I’ve used in three years of using Kodi. This thing has free streaming movies forever and they play so easily! Can I watch 3D movies on Kodi? Does anyone here know of any Kodi addons that have a special section for 3D movies, either animated or live action? Loving the way the Monster Munch checks streams and grabs one for Kodi to play on my Fire TV when I choose a movie to watch. Right on! This has great movies and finds streams for me without worry. Cheers!